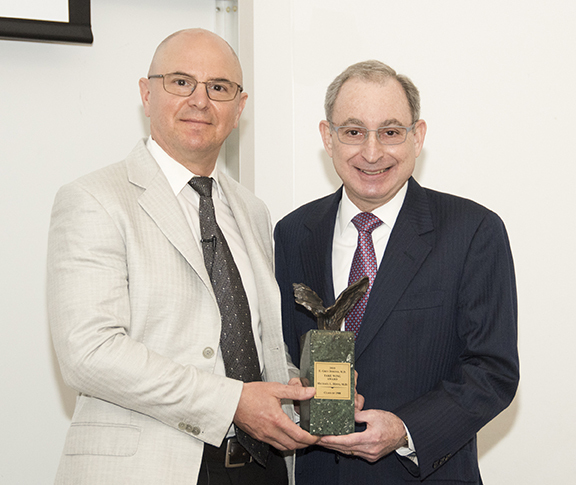 The E. Grey Dimond, M.D., Take Wing Award is the School of Medicine’s annual honor given to a graduate who has demonstrated excellence in his or her chosen field and exceeded the expectations of peers in the practice of medicine, academic medicine or research. Personal achievements and community or public service are also considered for the award, which is presented during graduation week. The Take Wing winner receives an engraved Take Wing statue and round-trip paid transportation and expenses to Kansas City to accept the award. The winner also presents the E. Grey Dimond, M.D., Take Wing Lecture and makes a brief speech to that year’s graduating class during commencement ceremonies. Take Wing is a bronze sculpture cast from a small carving made in 1952 by the late E. Grey Dimond, M.D., provost emeritus for the health sciences, from a piece of driftwood he found on the beach while visiting Carmel, Calif. His daughter Lark had the sculpture enlarged and cast in bronze. That sculpture stands in front of the UMKC School of Medicine, encouraging students and alumni to “take wing” and soar to new heights in their careers after they leave the school. Any graduate of the School of Medicine is eligible for the Take Wing Award. Anyone may make a nomination for the award. Send a letter of nomination to Ruth Grimsley stating why your nominee should be considered for the award. Document any professional or personal achievements by enclosing articles and a current copy of the nominee’s curriculum vitae if possible. Nominations are accepted year-round, however, the deadline for each year’s nomination is March 1. Click here to obtain the current nomination form (add “Take Wing” to the form as an award option). A pioneer in head and neck surgery, Hinni is internationally recognized for being in the forefront of developing minimally invasive procedures for surgical removal of head and neck tumors. These breakthroughs include designing instruments to accomplish better and safer surgery; contributing to the published medical literature on such topics as how much tissue must be removed to completely clear malignancy from the throat and surrounding areas; and presenting evidence for these medical advances at local, national and international forums. He serves as professor of otolaryngology and head and neck surgery at the Mayo Clinic School of Medicine and as head of the Mayo Clinic’s Department of Otolaryngology at Mayo Scottsdale, Arizona, where he created an independent otolaryngology residency program. Shroff is a nationally recognized leader in improving the quality and safety of patient care by merging medicine and technology. She is chief medical officer of the Nashville, Tennessee, TriStar Centennial Medical Center, the flagship hospital of Hospital Corporation of American (HCA), the nation’s largest for-profit health care corporation. Shroff initially joined HCA’s clinical services group as chief clinical transformation officer and vice president and was responsible for implementing electronic health records systems throughout the corporation’s more than 170 hospitals. Shroff served as associate chief of staff — informatics at the Washington, D.C., Veterans Affairs Medical Center where she played a vital role in the development of a number of technology tools to aid physicians and improve patient care. Her work has been published in scientific journals, and she has been recognized in publications such as TIME Magazine, the Washington Post, and CIO Magazine. Wright is the chief of the Division of Gynecologic Oncology at Columbia University College of Physicians and Surgeons and New York Presbyterian Hospital. He is also the Sol Goldman Associate Professor of Obstetrics and Gynecology at Columbia. His major research interest is health services and outcomes research. He and his team have undertaken large, population-based studies to examine the use of novel drugs and technologies for cancer patients, surgical quality, fertility preservation, and the management of complications in cancer patients. His work has been funded by the National Institutes of Health, the Department of Defense, and a number of philanthropic organizations. He currently serves as primary investigator or co-investigator on two R01 research grants from the National Cancer Institute and a national research grant from the Susan G. Komen Foundation. He has written more than 200 peer-reviewed articles and was last year’s recipient of the Foundation for Women’s Cancer Excellence in Ovarian Cancer Research Prize in honor of Ronald Alvarez, MD. Buie is a renowned pediatric gastroenterologist and a leading authority on medical conditions in children with autism. He serves as the director of gastroenterology and nutrition at the Lurie Center for Autism at the Massachusetts General Hospital for Children and is assistant professor of pediatrics at Harvard Medical School. Buie has developed an international clinical practice that has evolved into both teaching and research components. He has published a variety of papers and book chapters characterizing gastrointestinal problems in children with problems and developmental disorders. His teaching curriculum includes guidelines for parents and health care providers regarding behaviors of children with autism that may represent pain or other underlying medical issues. Buie is a founder and developer of the Autism Treatment Network, a collaboration of major autism research programs that work together to standardize the evaluation and medical care of children with autism. His efforts to educate the public on autism have received media attention including: The New York Times, Wall Street Journal, PBS-TV and the BBC-TV. Buie developed and co-produced an online medical video series “Office Hours with Dr. Tim Buie” featured on the Web site AutismSpeaks.org. Zweig, co-director of the Department of Respiratory Therapy and Pulmonary Function at Christian Hospital in St. Louis, is one of the first physicians to perform endoscopic bronchial ultrasound to diagnose lung cancer and one of the first physicians in the St. Louis area to do navigational bronchoscopy. The two procedures have largely improved the ability to non-invasively diagnose and stage lung cancers. Zweig’s involvement in medical leadership at Christian Hospital includes being past chairman of the intensive care unit and pharmacy committees; a member of the board of directors for the past 14 years; and past secretary/treasurer and current chief of staff for Christian Northeast Hospital and Northwest Health Center. Toth is director and founder of the Massachusetts General Hospital (MGH) In Vitro Fertilization Unit and the Reproductive Endocrinology/Infertility Fellowship Training Program at MGH, and an associate professor of obstetrics, gynecology and reproductive biology at Harvard Medical School. An expert in reproductive endocrinology, he has made a career of helping couples with seemingly little or no hope of becoming pregnant to achieve their dream of having children. He joined MGH and the faculty of Harvard Medical School in 1992, immediately after completing his residency at Brigham and Women’s Hospital and MGH and a fellowship at the Jones Institute for Reproductive Medicine. The National Institutes of Health and philanthropy have funded much of his extensive research in the field of assisted reproduction. He has been recognized by Boston Magazine as the top doctor for women’s infertility and also received the 2002 UMKC School of Medicine Alumni Achievement Award. Jackson, chief of pediatric infectious diseases at Kansas City’s Children’s Mercy Hospitals and Clinics and a professor of pediatrics at the UMKC School of Medicine is a nationally renowned expert in pediatrics and infectious diseases. She serves on the American Academy of Pediatrics’ Red Book Committee on Infectious Diseases, a publication that provides guidance on the diagnosis,treatment, manifestations and epidemiology of more than 200 childhood conditions. In her additional role as associate chair for community and regional collaborations, Jackson has developed and edits a similar publication, The Link, for community and regional child health care providers. The Link identifies best clinical practices for common pediatric conditions and provides monthly updates on issues related to childhood immunization. Jackson received the Clinical Teacher Award in 2001 for her support and dedication to community pediatricians. Fitzpatrick, associate professor of medicine at Howard University and consultant/technical advisor to the Washington, D.C., Department of Health, has made national and global impacts on HIV/AIDS research and treatment. Her career is highlighted by experiences in clinical medicine, epidemiological and prevention research, public health leadership, management and program development, community outreach, education and service. She has served at the Centers for Disease Control and Prevention as a US Diplomat, director for the CDC global AIDS program, and was responsible for implementing the President’s Emergency Plan for AIDS Relief in the Caribbean Region. As director of the CDC’s Minority HIV/AIDS Research Initiative, she established an initiative to recruit, mentor and support junior scientists of color to conduct HIV prevention research. In 2010-11 she forged an academic/community partnership that led to the establishment of the first infectious diseases outpatient center in Washington, D.C.’s, safety net hospitals for the poor and underserved. Braverman is widely recognized as one of the leading authorities on the connective tissue disorder known as Marfan¹s syndrome. He is a professor of medicine, cardiovascular division, and chief of the inpatient cardiology service at Washington University School of Medicine in St. Louis, and directs one of the largest clinics in the world dedicated to Marfan¹s syndrome at the Barnes-Jewish Hospital. His long list of recognitions and awards encompasses all areas of medicine: academics, clinical medicine, and research. A highly-recognized researcher in the field of gastroenterology, LeSage is a professor of medicine and chairman of the Department of Medicine at East Tennessee State University¹s James H. Quillen College of Medicine in Johnson City, Tenn., where his work focuses on bile acid modulation of bile duct growth and secretion, regulation of bile acid transport in bile ducts, development and application of light microscope techniques to cell biology, and development outcome and economic models in Hepatitis C-infected patients. The National Institutes of Health¹s National Institute for Diabetes and Digestive and Kidney Diseases awarded Dr. LeSage a $1.7 million grant to study bile acid regulation. Warner is a distinguished pediatric surgeon who has achieved enormous levels of success in all areas of academic surgery from patient care to education and research. He was appointed chief of pediatric surgery at the St. Louis Children¹s Hospital and Endowed Apolline Blair Professor of Surgery at Washington University School of Medicine in St. Louis following nearly 16 years at the Cincinnati College of Medicine and the Cincinnati Children¹s Hospital Medical Center. He is an international leader in surgery research, including pediatric cancer surgery and minimally invasive procedures.